Phase 1 of the review expedition. Watch out, I score everything, out of 100. If you'll think grades, that will be appropriate; 90 is A-, 80 is B-, 60 is the D-, and so on. Released from our closed-for-maintenance library for 3 hours (plus an hour for lunch) I climbed into Dave's jeep. It was very high up, but I managed, as I am nimble. Our drive was oddly like one on an uneven dirt road even though we were on well paved roads. Dave said that's pretty much how the jeep is. Dave does not seem to love the jeep. I have never been in a vehicle that seemed to be at such pains to grip the road tenaciously at every single moment. But this is not a review of the jeep! Onto the library. 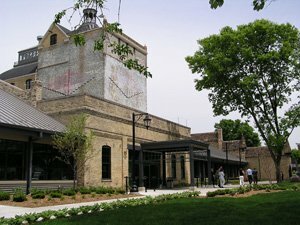 We traveled a good distance on Broadway St. which was a boring street that seemed industrial but without conviction, and then, all at once, came upon the paradise of Industrial Retro Rehab Chic that was the complex of the Pierre Bottineau Library. I'll go see if I can fetch any pictures for you now. Hmm, so, just, uh, sort of borrowed this from the internet. 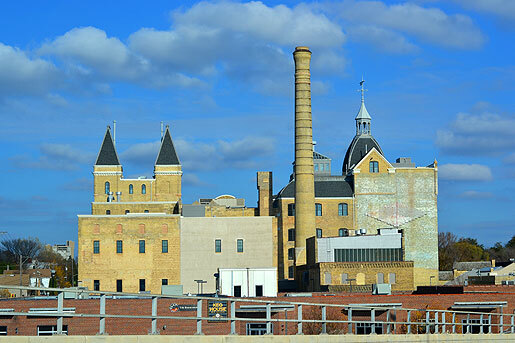 And I am not interested in providing historical perspectives and suchlike, but am grudgingly willing to say this is the Grain Belt Campus, which I think means it was a big factory complex now all redone for other uses. I am not even sure where the library is in this picture, so onto the next pictures. 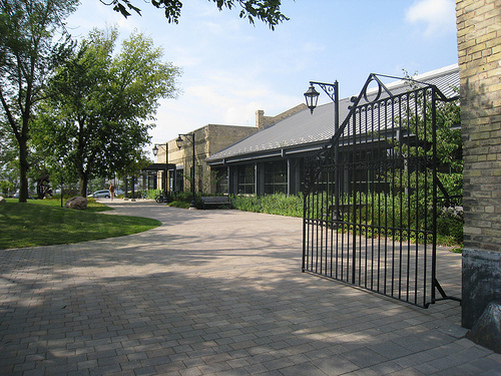 Okay, so this is the gated entrance to a quiet and pretty little, not quite park, it's more like the front garden of the library. All that Grain Belt stuff would be to the right here, behind the library. We also parked back there. Actually, due to a small, insignificant navigational mishap, we parked in the lot for an Architectural firm that's in the main factory building. We actually had to walk out to the street through a lovely sort of brick arched tunnel to the street, walk up the street a small bit, and enter precisely at this above gate. This is the library with the main building behind. That big building, where the Architects were, is not physically connected to Pierre Bottineau, but it is architecturally. This is opposite the previous picture, which would have been taken at the far right. And lastly, a picture of the main stacks of the library inside. It's just as nice inside as out. But maybe it doesn't seem so nice to you outside? Honestly it doesn't photograph as nice as it is. So, if it is not clear, I really liked this whole place. And it was a very auspicious beginning to our library expedition. There are even more good things than is covered above. I liked how you walk in to staff, like, they're in the main entry hall behind a counter. You turn right to go to the room in the picture above and left to go to their kids room. But the lobby and service counters make a sort of integrated "T" (though the top of the t is wide, and the bottom is short). I think the staff person even said hi to us as we entered, which is not the sort of thing I care about much, but just felt natural here. The building had nice light and a nice feel. It was quiet and the ever popular internet computers didn't dominate the place. The kids room felt a bit muddled and crowded. They had loads of public art, starting with a modernist steel sculpture in the front garden, going to some big murals in the front lobby, to what was apparently a temporary show of acrylic paintings of local industrial scenes (by one artist) that was perfectly appropriate for the library and of a very high standard. There was an unnotable painting in their throwaway teen nook, and there was a small reading/research room devoted to local history that had some old photos displayed. They did not captivate me, but I loved the idea, and the room seemed thematically appropriate to the library. Number of Agatha Christie books on shelf: 15, respectable though uninspiring for a smaller branch. It was clean enough, and pretty, quite in keeping with the building. It had one stall and one urinal. I strongly feel then it should be a single person bathroom. I am a private person! Cannot speak to the Ladies Room, but seriously, they could have done 3 unisex rooms in this space. Can you leave it with us and we'll give it to someone to see if it's okay? I said yes instead of "Can you look at it and figure out if it's okay? How hard can this be?" because I am polite and rather too fatalistic. No, and I didn't feel there was one super close by, but I don't feel I should be too hard on this. Pierre Bottineau (January 1, 1817 – July 26, 1895) was a Minnesota Frontiersman. Known as the "Kit Carson of the Northwest", he was an integral part of the history and development of Minnesota and North Dakota. I could easily have continued to show you his picture and provide his local context (he had a lot to do with founding the city of St. Anthony, near the Library, which was later annexed into Minneapolis), but I think you get my point. And besides all that easy stuff that was mere keystrokes away on the internet, this branch has, as I mentioned, a small room devoted to local history, which, unless it is so pathetic that it should be converted to a Video Gaming room, will undoubtedly have some of the best and most useful materials on Pierre Bottineau anywhere, internet included! Do they have a copy of The Blue Sword? The Librarian said first "By Robin Mckinley?" By Robin Mckinley indeed. Well done! This pleased me much! Unfortunately they had only two copies in the system, both out. She did offer to request it for me. I didn't get any commiseration or alternate choices, just, to explain the touch of mildness in my positive score below. What is her favorite book? She would have to pick Tolkien's Trilogy, which was chosen without dissembling, just straight up, something I appreciated, and it was a choice I liked too. Once again, to explain the limits of my fully positive score, her enthusiasm drew a line, and she did not feverishly say, when I spoke of my affection for Lord of the Rings, something like "Oh, but have you read the great Blue Sword? It is nearly as good in it's own way! Oh, but right, we only have two copies because our teen collection buyer is demented." which is the kind of color commentary I would have needed to score a 100 on this one. Dave, a St. Paul resident, asked if he could get a card. Asked if he wanted to Check Out today he said he'd like to, but he didn't need to (by the way, kudos to Dave, that was such a good answer! Enough to invite the clerk to screw up, but not unfair). They said it would be a lot easier if he went to St. Paul directly and left it at that. As your library savant I can tell you that, a. this would be a lot easier for the clerk, not really for Dave, who would have probably hardly suffered, and, b., this answer is only acceptable to "No, I'm leaving. I don't want to get anything now." In all other cases the clerk's response was awful. I looked for a copy of Fear and Loathing in Las Vegas by Hunter S. Thompson. Like Dave's bait question above, this is just the sort of thing libraries screw up on, unsanctioned foundational classics that people are always reading. And they sadly failed the bait of my search. Certainly not checked in at Pierre Bottineau in any form. They had, actually, interestingly, a few audio books of it in the system, a reference copy, a few unavailable ebooks, the movie, and a paltry 2 physical copies, both requested because, well, of course they are. 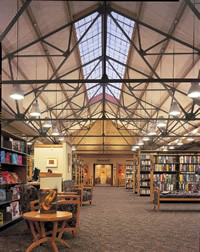 Pierre Bottineau is a beautiful library in an unusual part of town. It's design is interesting and harmonious and the space is mainly used well and consciously. The collection seems adequate if uninspired. The staff seems to be, casually speaking, under no great pressure, and has sadly responded with sleepiness rather than inspiration. The delightful facility does much to save it from a far more middling score, but the failure of its great promise also tempers that score strongly. Interesting. I love how you tested the librarians, and shared your scores with us. My husband used to travel a lot for work and I'd go with him. I tried to always check out the local library. Liked the one in Cleveland. Hope you like the Blue Sword. I popped on to Amazon just to see if it was receiving justice. Whoa! Lots of believers there! Its companion book "Hero and the Crown" won the Newberry medal but I think The Blue Sword is distinctly better. I do that traveling too sometimes with libraries, but it's only the blog that is getting me towards doing it where I live, which is just as interesting.